Coin Puzzle - ADDICTIVE ITSELF!! Are you an expert to calculate numbers? How can you do it fast? Your calculating ability can be proved by playing this game. 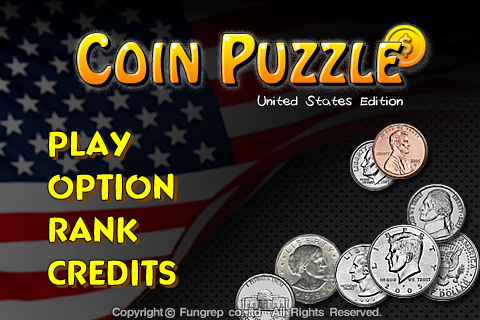 The main purpose of COIN PUZZLE is how fast and acurate to composite coins by choosing them. 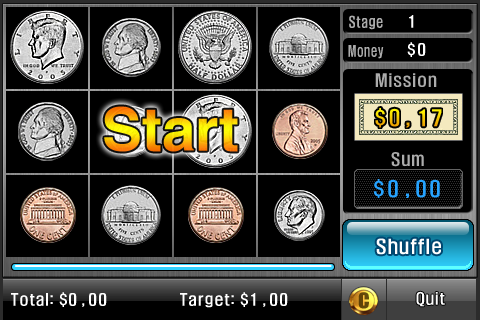 Game Mission is to make “MISSION MONEY” by compositing various coins by choosing given coins on the board. 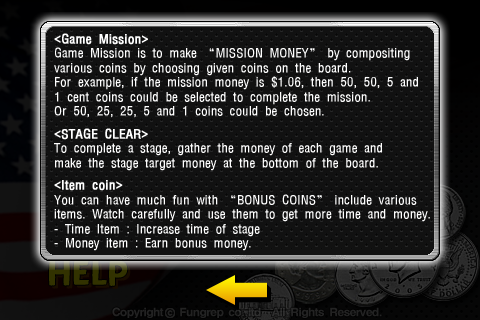 For example, if the mission money is $1.06, then 50, 50, 5 and 1 cent coins could be selected to complete the mission. Or 50, 25, 25, 5 and 1 coins could be chosen. 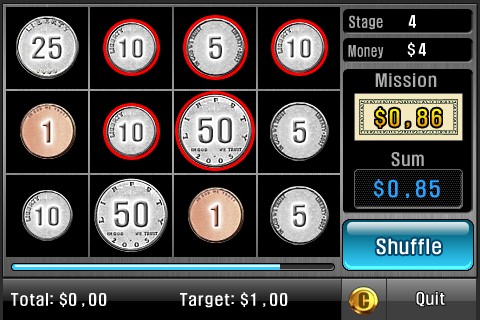 To complete a stage, gather the money of each game and make the stage TARGET MONEY at the bottom of the board. 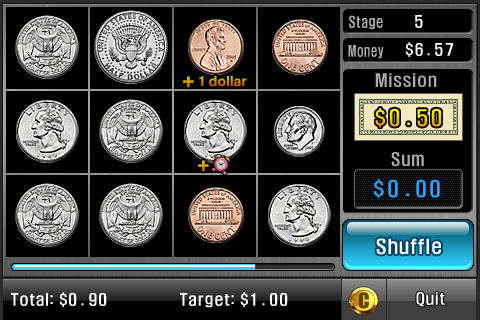 You can have much fun with “BONUS COINS” include various items. Watch carefully and use them to get more time and money. ♧ MONEY ITEM : Earn bonus money. ♧ Special Screen Change Effect : Various display transitions and effects will be fun. ♧ Simple & Hi Quality Graphic : Simple and high-quality graphical screen design provides elegant design. ♧ Long Battery, Low CPU : Using the low power system of “CK IPhone Game Engine” optimized to iPhone or iPod touch, players can enjoy to playing for long time. To view all of fungrep's titles, click "ALL APPLICATIONS BY FUNGREP"